Rolling fog. Watch and wait. It doesn’t happen very often, but when it does, you have to be ready. There can be nothing more important. Drop everything you’re doing, just let things fall where they are because something very special is about to happen—lasting only minutes at best. I quickly needed to move into position because the fog was rolling in. Usually, it works its magic when no one is watching, so only those alert and ready can actually bathe in its cleansing mist. It happened Saturday morning at 9:46. The day was overcast and cool, as was my mood. Looking out over the valley from the bedroom window, everything was covered with a gray watercolor wash, painting the hills a mysterious muted tone. 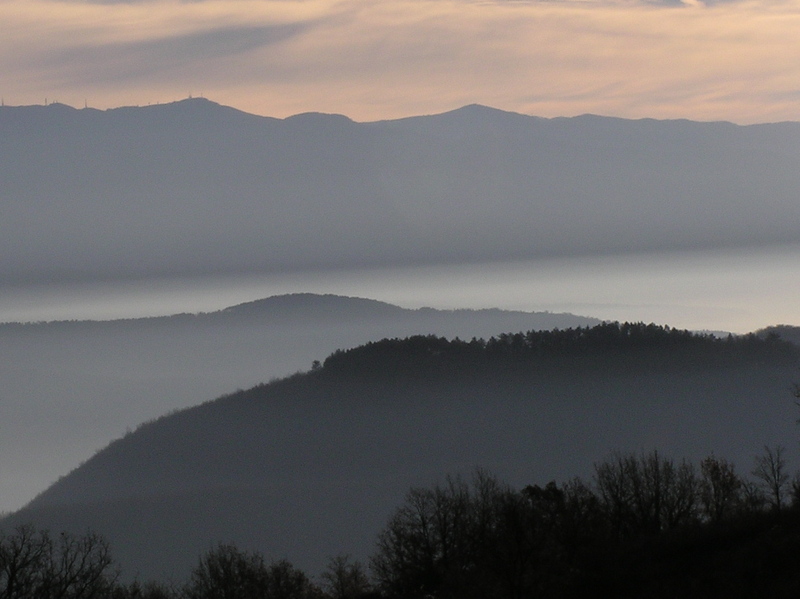 The valley below had long since disappeared, as the fog lay heavy and dense, creating the illusion of a vast mountain lake with hilltop islands rising from the white-gray waters. Perking up, I realized what was happening. I needed to move quickly into position. Without wasting a moment, I briskly descended the steps and then slipped out the door. I gently stepped through the wet grass like a cat on an early morning prowl, to enter the garden. 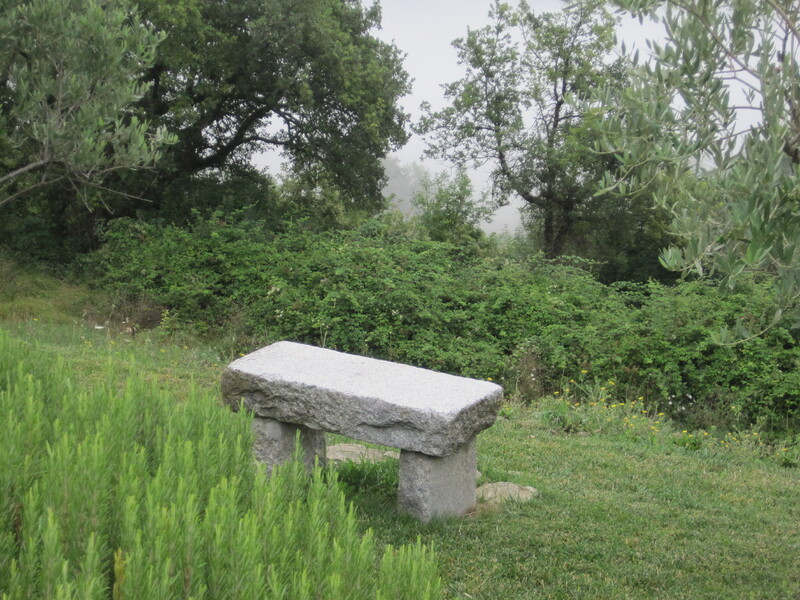 When I reached the old stone bench, I sat down precisely in the center. Back straight, head up, eyes closed and releasing all thought, I took several deep breaths. 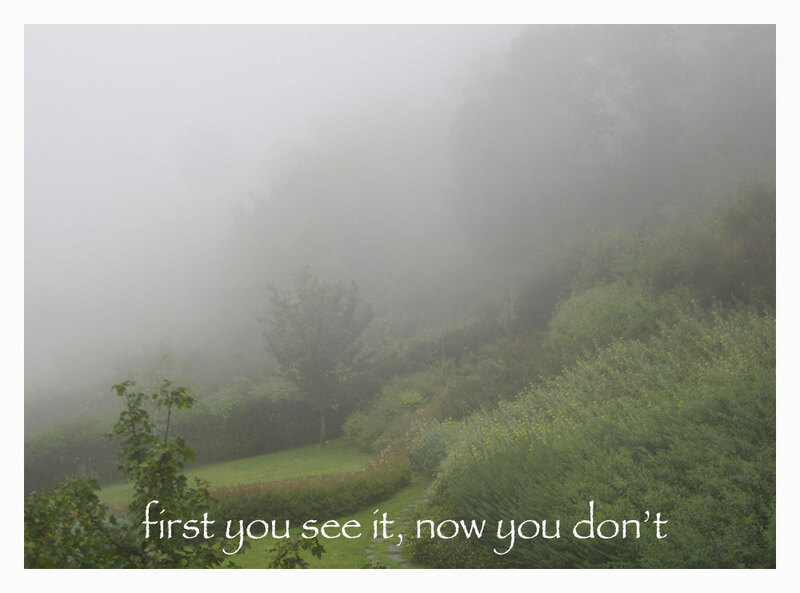 I could feel it sweeping up the hillside toward me—cool fresh fog, thick, misty and full of intention. I could hear it approaching through the treetops, pushing the air aside. I imagined the taste of cold steely freshness as it surrounded me, shrouding everything in its path. Within minutes, the momentary gift mysteriously receded as quickly as it had arrived, rushing swiftly down into the valley, melting back into the lake. I felt refreshed and rejuvenated from the purifying vapor—nature’s way of washing away that which the rain can’t touch. Walking back to the house I felt refreshed, awash in a mood of warm possibility.